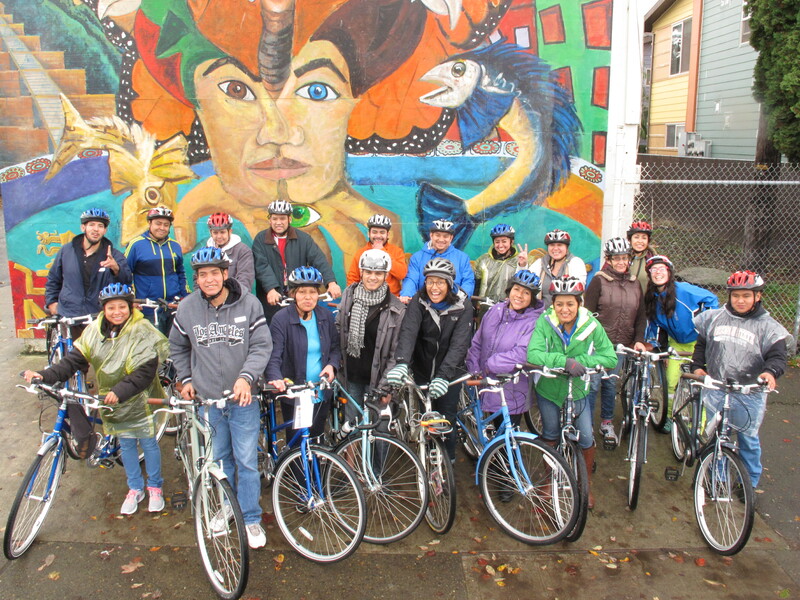 A few weekends ago, I had the pleasure of volunteering with the Create a Commuter workshop held at Hacienda’s Salon Comunal, or Community Center, in Northeast Portland. For those who aren’t familiar with the program (I wasn’t until I volunteered for it! ), Create a Commuter identifies low-income adults in need of transportation, trains them in bicycle safety and basic bicycle maintenance, and at the end of the workshop, participants get to leave with their own bike, completely outfitted for commuting! And do I mean outfitted – not only were the bikes sweet, they came with fenders, racks, lights, pumps, everything! The amount of material that’s covered in the five-hour workshop is astounding, but the two incredible instructors that I was there to support were able to make the workshop informative, engaging, and most importantly, fun. What made this workshop particularly special and exciting is that many of the participants spoke primarily Spanish, and so the workshop was taught completely in Spanish. I rarely get to practice my Spanish, so I was excited to spend an entire day speaking it. We began the day with a check-in where everyone introduced themselves, and told the group about what they hoped to do with their bicycles. A fair number of the participants had children who participated in the Community Cycling Center’s Bike Club program at Rosa Parks Elementary School, and accordingly, these participants wanted to be able to ride bikes with their kids and take them on family outings. One of these parents told us about how her kids were now zipping around on bikes and she wanted to be able to join them. Another participant explained how the bike would make it much easier for him to get to work, since he lived in outer northeast and was commuting by bus to Lloyd Center. Others looked forward to being to be able to run errands, such as grocery shopping on their bikes, and everyone was excited about being able to ride their bikes just for fun. From there, our two instructors, Lale and Dennis, took over. Lale is a seasoned Bike Camp instructor, and jumped right into covering bike safety, guiding us through helmet fitting, and little details like remembering to roll up your right pant leg. We moved on to fitting people on the bikes, and that’s when people got to “meet their bikes.” Everyone got to take their bikes outside and practice putting the bikes on a TriMet rack (the kind found on the front of busses) and riding them. We took a quick break for lunch, which was delicious tacos, a nopales salad, and kiwi juice provided by a small business owner associated with Hacienda. Next, we moved on to preparing for the highlight of our day – the group ride. 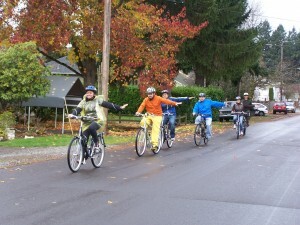 We went over how to read maps, and then planned a ride to a nearby Safeway. It was here that we got to put everything we had just learned into practice. You could feel the energy and excitement during the ride, and even though we got lost (oops, we’re navigationally challenged) for a few moments, it didn’t put a damper on the group. Once we arrived at Safeway, everyone was able to practice locking their bikes up, ensuring that their new rides would not be stolen. We rode back to the Salon Comunal to cover the last bits of the workshop. All of the participants received tire levers and patch kits, and Dennis went over how to patch a flat tire with the group. As the workshop started to wind down, we had some final questions, and that was that! As everyone left the Salon Comunal, I was amazed by the outpouring of gratitude from everyone who participated in the workshop. I received a lot of handshakes and thank-yous (as did the instructors and the other support member). It was really spectacular to see how happy everyone was. 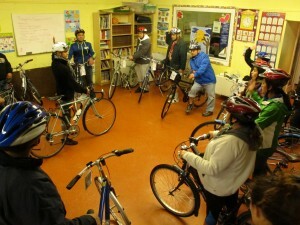 Overall, I’m really glad I volunteered with the Create a Commuter workshop. It was incredible to see all of the work that goes into the Community Cycling Center’s programs, and to see the effort that the instructors put into making sure that people will be empowered to use their bicycles as a legitimate vehicle for transportation. For more photos from this Create a Commuter workshop, please visit our Flickr page here.